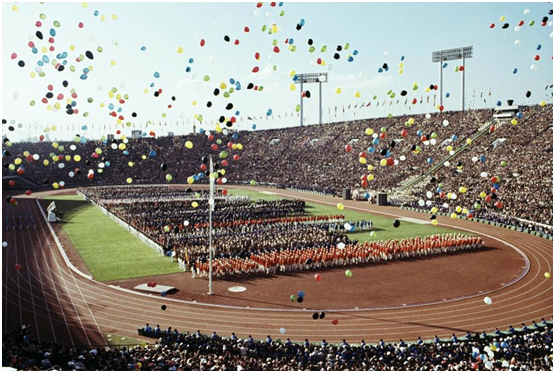 The 1964 Tokyo Olympic Games were signified by the world accepting Japan back into the global community. It was the first time the Olympics had been broadcasted to a global audience. But perhaps most importantly (for this story anyway), a truly authentic bike rider by the name of Mick Hollingworth pinned the Australian colours for the first time. Let us take you back to a time where there were no sponsorships, salaries or assistance from the Australian Institute of Sport (because it didn’t exist until 1981). 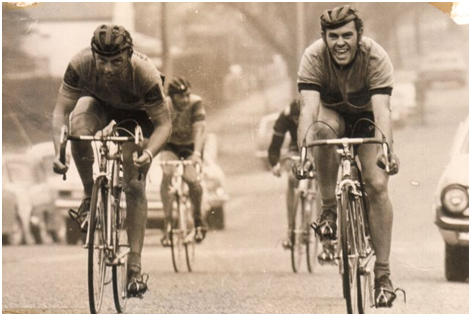 There were no fancy road bikes – Trek, Specialized and Giant all weren’t created until the 1970s. A time where it was all about the love for the ride. In 1958, at 14 years of age, Mick started working for Eddie Goodman, the local butcher and Mick’s neighbour in the Melbourne suburb of Chelsea. Eddie was a keen cyclist and he encouraged Mick to take up bike riding. Mick was already racing his mates down the back streets going to the local footy games, so it wasn’t all that hard to convince him to get on a road bike. 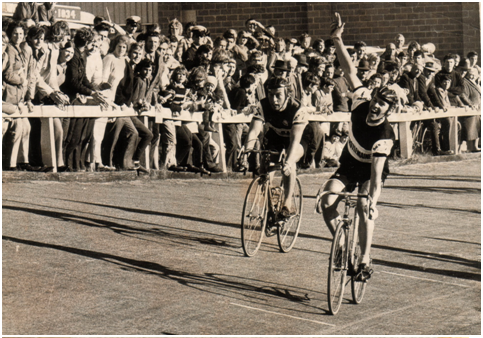 One year later Mick and the family moved to Carnegie and he joined one of Australia’s oldest and largest cycling clubs – Caulfield Carnegie Cycling Club (CCCC). Whether it was the fact that Mick’s new club had a real racing track or that the local crowds created an electric race atmosphere, Mick’s love affair with the bike took off to another level. In 1964, at 22 years of age, Mick was a contestant for the Australian Olympic Pursuits team, which would be heading to Tokyo later that year. Unfortunately, Mick didn’t qualify for the Olympic Pursuits team but three months after just missing out on his dream of going to the Tokyo Olympics, Mick came first and second consecutively in a three-day road race series during the Australian National Championships. Instead, Mick became part of the Olympic Road team. Mick taking out a win at the track. Consider this – you’ve just made it to the Olympic Games, representing a country that’s economically strong with sport running through its DNA. You’d think you’d be set. An athlete representing Australia at the Olympics today will receive funding and organisational support from the Australian Olympic Committee before and during the games so athletes can focus on their performance. Things were a little different in 1964. Mick and his team mates weren’t offered a bike or equipment as part of their place in the team so three months prior to the games Mick organised for his bike to be sent over to Japan on a ship. In order to keep training while his bike was being shipped, Mick went around to several bike shops to borrow a frame, components, wheels and whatever else he could piece together in order to keep training. Mick was working as a turner and fitter five days a week, but managed to get an extra day off each week (unpaid of course) to fit in the extra miles needed to be at his peak fitness during the Olympics. After finishing work, Mick would ride up and down Beach Road until around 8 pm. In those days most Melbourne homes would burn coal fires, so Mick would be covered in coal dust by the time he finished: “I would get home and it would be like I’d just got back from the mines”, says Mick. Scenes from the 1964 Olympic games in Tokyo. In mid-October 1964 Mick boarded a Qantas Boeing 707 heading for Tokyo. Upon his arrival, Mick realised that he had missed an information meeting back in Australia where all athletes were given luggage tags so their luggage would be dropped at the Olympic Village. Mick’s bag subsequently vanished, and as a result, he acquainted himself with Tokyo by trying to purchase some clothes in a country that at the time spoke very little (if any) English. Once Mick and the team settled into the Olympic Village, it was time to get together and discuss race tactics. “So what’s the plan for the race?” Mick asked the coach, Joe Buckley. “I reckon if you blokes can finish with the main bunch you’ve done a great job”. Joe was somehow made coach for the Olympic Road team but he was hardly comparable to the calibre of today’s coaches.. His assumptions were that the European guys would rule and there was no need to contemplate any podiums. This nonchalant approach, conflicting with the never-say-die Aussie attitude, was proven wrong by Mick and his teammates a few days later. On race day, 22 October 1964, Mick was raring to go. True to his gutsy and determined reputation, Mick was in the early break in the road race and was out for a while, grinding it out. Eventually the main bunch caught the break, but Mick and Australian National Champion, Ray Bilny stayed right in the mix until the end. In fact, Ray just missed out on a podium position, finishing fourth. Mick came in a few bike lengths behind in fourteenth place – two spots behind superstar Eddy Merckx. Not bad for a team without a race plan! In fact, truth be known, not only did Joe deprive the team of a race plan, he also relinquished their right to participate in a hundred kilometre team time trial on the first day of the games, as he thought the team wasn’t up to it. Imagine what could have been! After the Olympics Mick stayed heavily involved in cycling and eventually turned professional. He had great success in State and National track and road racing and represented in six Sun Tours, winning multiple stages over the years. A few riders took a dive towards the end of the road race, including Mr. Merckx. Mick has been a member of the Caulfield Carnegie Cycling Club for almost sixty years, but he still thinks back to a defining moment, which happened within the first few months of joining the club. Recognising that Mick was new to the sport, some older club members took him out for a ride to teach him the ropes. They went on a fair journey, introducing Mick to roads he’d never come across before. As they ramped up the speed towards the end of the ride – with the sun disappearing behind Melbourne’s horizon – they flew down dark streets, forcing Mick to hang on for dear life. He made it back, just, but what Mick hadn’t realised at the time, was that this ride would set the foundations of his cycling career. This ride, along with the many club rides that followed, cultivated Mick’s “don’t hold back” mindset and his nurturing attitude towards fellow bike riders. Mick now invests his own time into supporting local cycling, and has done so for the past thirty years. A number of years ago he spent time as President of CCCC, heavily involving himself in the strategic direction of the club and everything in-between. But perhaps the most significant legacy he’s given to the club is his work teaching young kids and those trying out the sport for the first time. Every Sunday morning Mick shows up at the Glenvale criteriums to ride around with the beginners, teaching them the ropes and providing a supportive platform for the club to find new talent. Whether you’re a pro, amateur or recreational cyclist, with today’s consumerism and digitalisation, it easy to lose the true connection we have with our passions. Mick’s story is a good reminder to us all about how the authentic elements of cycling – grit, determination, adventure, community and a sense of giving back – are the foundations that make the sport of cycling so special. 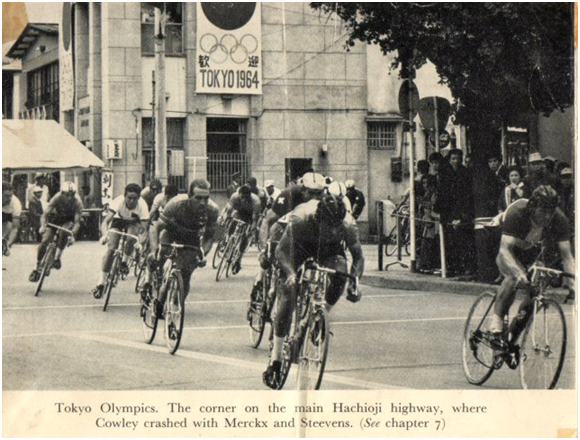 You can find a video clip from the 1964 Olympic road race here. 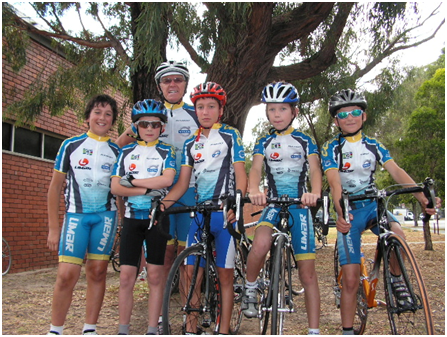 Mick with some of his star pupils from Caulfield Carnegie Cycling Club. David Sturt – MAMIL or Mystique? Great read. Love hearing about the old school era. Mick has got the most beautiful position on a bike , so relaxed ! He was so still on the bike , a joy to watch ! I was fortunate to be in the training squad with Mick, Ray, Tom, and more for Jamaica and Mexico. Mick was extremely competive but always ready to help and deserves all he has.